Sony KDL-55W905A review | What Hi-Fi? 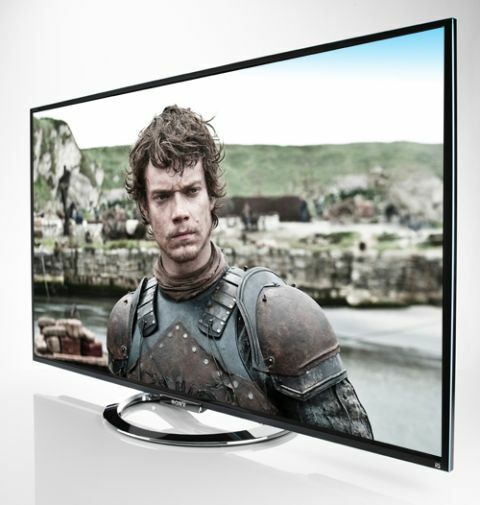 Sony’s 2013 TV range has quite the act to follow. Last year’s HX853 TVs impressed us so much that they won Awards in three of our screen-size categories, including the highly coveted Product of the Year Award for the 40in Sony KDL-40HX853 TV. That’s certainly one way to stick it to your Korean rivals. So it’s with great anticipation that we’ve unwrapped the 55-inch Sony KDL-55W905A, the largest screen size in Sony’s high-end W9 series. First impressions are promising. It’s a seriously good-looking set, with a super-slim black bezel and rather uncharacteristically skinny profile to match. It marks the debut of Sony’s new Sense of Quartz design, which introduces an attractive but subtle flash of blue along the top edge of the bezel that’s inspired, says Sony, by the cut-glass surface of quartz crystal. Marketingspeak that might be, but it’s a nice touch that you’ll see on all of Sony’s top-end sets, and a design language that will carry over to other Sony products, such as Blu-ray players and speaker packages. Doubleplusgood. Sitting at the bottom of the set’s display is another new addition to this year’s Sony TVs – a small mirrored box called the “Intelligent Core”, which will illuminate and change colour depending on what input you’re using. All this style and design is piled on top of a rather attractive silver circular stand, compact enough to fit on most AV racks, and a nice contrast to the rather sharp angular design of the set itself. It’s a looker, then, but what about everything else? The KDL-55W905A might not have the 4K smarts of the very top of Sony’s 2013 line-up (the X Series, due in July), but there’s still plenty of new technology fresh from Sony’s labs that’s worth a look. The headline feature is arguably Triluminos, the display tech behind the 905A’s 200Hz panel that aims to widen the colour gamut and, in particular, improve the reproduction of reds, blues and greens so they're truer, deeper and more varied compared with competitors’ displays. This is achieved using new edge-LED backlighting know-how that ultimately gives the W9 series a wider and more accurate spectrum of colours to play with. Sony says this will deliver more vibrant and lifelike results. More on that shortly. Also on board is Sony’s new and improved X-Reality Pro technology, which purportedly uses an extensive database of visual information for more accurate video processing. The goal is to bring more clarity and sharpness to proceedings, while also keeping noise to a minimum, particularly when upscaling. General specs get a tick in the more-than-adequate box too, with four HDMI ports, three USB ports (including one for recording from the set’s built-in Freeview HD or satellite tuner), composite, component and RGB scart inputs, digital audio out, a headphone jack and the choice between a hard-wired ethernet connection or built-in wi-fi. Once we’d tweaked the picture settings using our ever-faithful THX disc, we put sci-fi action film Looper on to test it out. Immediately we were struck with the level of detail the KDL-55W905A delivers, with edges appearing sharp and outlines defined. It makes good work of skin tones too, delivering a natural result without any extra tweaking required. Seeing Triluminos in action left us sitting on the fence, though. Reds are certainly more vibrant and textured compared with those on the Panasonic TX-P55VT65B, while luscious green landscapes are delivered with real punch, with the W905A picking out a wider and truer range of colours for grass and trees. However, it was the blue performance that we found to be a little inconsistent. While it did its job when it came to blue clothing or objects, we found the sky in a number of scenes could lean towards looking overblown and fake. For example, in one scene set at dusk, the sky appears an unnatural and rather distracting colour of blue. Daytime shots, meanwhile can look too ‘painted on’ to be convincing. That said, cloud detail and definition, which could look bleached on the Panasonic, are picked up much more effectively because of these heightened blues. Black levels are as impressive as they were on the Sony KDL-HX853, achieving arguably the deepest, darkest blacks of the current crop of rivals. Unfortunately, the rather unacceptable trade-off is that you’ll lose a lot of detail in darker scenes. Compared with the Panasonic plasma, which shows off shade and texture in spades when things get gloomy, the Sony loses grasp of the subtleties in darker scenes. Whites, by contrast, are handled pretty well. There’s a slight blue tinge to them in the brightest scenes, but overall it’s a good performance, and trumps that on the VT65, which has whites that can look a little off-colour and less punchy in comparison. A rather big issue that we experienced is the Sony KDL-55W905A’s viewing angle – one so narrow that we found two people sat on a two-seater sofa could see quite different pictures. It was particularly noticeable in the TV’s black levels, which got greyer the wider you moved away from the central sitting position, both vertically and horizontally. This means room layout should be a huge consideration for anyone contemplating this Sony, and a big disappointment to see at this price. Motion was handled well on the whole, and even with no motion processing switched on there’s very little judder to complain about. That said, we did opt for a low setting of Sony’s excellent MotionFlow technology, which manages to smooth out any rogue judder issues without introducing any negative effects to the picture quality in the process. Speaking of processing modes, there’s a wide range at your disposal, and while we’d recommend switching most of them to off or low to begin with, they are always worth a look to see if they can tweak or fix any issues you might be experiencing. Some are certainly more useful than others. Take a look at Reality Creation for introducing more sharpness to your picture, while LED Dynamic Control will give you better control over the local dimming. Live Colour, on the other hand, is certainly an option we’d steer well clear of – the overblown, over-saturated colour reproduction that comes with switching it on is not a pretty picture at all. Edge and detail enhancers are also there, as are noise filters, but remember that adding these into the mix will always lead to a trade-off in another area of the picture. If you feel the need to use them, tweak slowly and steadily so you can find a balance you’re happy with. We switched over to the Freeview HD tuner to try out the TVt’s standard-def upscaling capabilities, and we’re pleased to report that the KDL-55W905A does this with authority. The X-Reality Pro software really is up to the challenge: images are reproduced notably crisper than other upscaling we’ve seen recently, and with very little noise. It’s a great performance and makes SD content viewing much more palatable while we wait for more HD channels to launch. When it comes to 3D, Sony has opted for an active-shutter method in place of passive tech. Of course, this offers all the benefits of a full HD 3D picture, but with the downside of potential flicker-fatigue – making it harder to watch for extended periods. We could certainly feel our eyes working after just a few minutes of putting the 3D glasses on (there are four pairs included in the box), but it’s a trade-off, and one that many picture purists are happy to make. We put on Martin Scorcese’s Hugo to see how it handled this made-for-3D film, and it has to be said the results were seriously impressive. Crisp and detailed, the Sony KDL-55W905A TV does a great job of relaying depth and space to the viewer, and is probably the most dramatic and effective 3D performance we’ve seen on a 2013 TV. Colours are vibrantly reproduced, the picture is bright and moving images are on the whole stable. We did notice some instances of minor crosstalk in panning landscape scenes and some evidence of image instability when objects were coming out of the picture towards you, but these small niggles don’t take away from the overall superb 3D experience. Sony has taken a good look at its smart functionality and overhauled it for 2013. Gone is the Xross Media Bar interface and in its place is a cleaner, easier to understand and more visually appealing version. The KDL-55W905A's menu keeps it pretty simple. Accessed by pressing the “Home” button on the remote, a series of sub menus appears in list format, including settings, applications, connections and history, for quick access to most recent channels and inputs. Each option under every sub-heading appears on its own tile, which you then click to be whisked away to what you’re looking for. The Sony Entertainment Network, where you’ll find all your apps, can be accessed through this menu system or via the “SEN” button on the remote. Most of the usual suspects are there, including BBC iPlayer, Netflix, YouTube, Facebook and Twitter, though prominence is given to Sony’s streaming services, Video Unlimited and Music Unlimited, which appear at the top of the page. Skype is on-board too, but unlike the majority of its rivals, this 55in Sony TV doesn’t come with a built-in camera. You’ll need to buy the optional webcam accessory if you want to video chat to your mates using your TV. Also notable by their absence is the lack of voice or gesture controls in the W905A, which many manufacturers seem to have gone big on this year. However, given the mixed bag of results we’ve seen so far, Sony’s abstention might not be a bad thing. You’ll still get two remotes in the box, though – and while the second doesn’t feature a touchpad or motion-gesture smarts, it does still have a few tricks up its sleeve. Slimmer and more premium-feeling than the standard Sony remote, it scales back the controls to the bare minimum, but gives you access to a few different features that the other remote doesn’t. First up is ‘fast zapping’ – a method that lets you quickly skim through what’s showing on TV, with a video preview of each programme to help you decide if you want to watch it. Secondly, the remote features an NFC (near-field communication) chip in the back. This enables one-touch pairing with a Sony Xperia Z smartphone for quick and easy screen mirroring, with the phone offering haptic feedback and the TV’s Intelligent Core glowing white to indicate that they’re paired. We found this to work well and without issue, although we look forward to Sony allowing any NFC phone to play nice with this feature – something the company tells us it’s working on as we speak. Sound is an area that many TV manufacturers are paying more attention to these days, and Sony is no exception. On the KDL-55W905A it uses a 1.2m-long speaker duct, placed on the back of the TV to encourage a wider, more open sound and deeper bass. Its downward firing speakers also feature ‘reflector’ wings, which push the sound forward to prevent it leaking behind the set. Unfortunately, with all its good intentions, it’s a battle only half won for Sony. Dialogue is crisp, clear and forward, but everything that surrounds it gets lost in the mix, making it feel thin and unconvincing as a stand-alone proposition. Although it manages to project sound away from the screen to make it feel bigger than the TV itself is, it is still an ultimately small sound compared with that offered by the Panasonic VT65. Dialogue certainly sits back a little in comparison on the Panasonic, but bass is more powerful and the overall presentation is larger to create a much more enjoyable sound, particularly when watching movies. Still, if you’re forking out £2400 on a TV, we’d expect you to be pretty serious about your home-cinema kit. So if the Sony KDL-55W905A is the TV for you, we’d certainly suggest investing in a full-fat speaker set up to get the most out of it. The W905A has had a hard-fought battle. While it excels in some areas, such as a blinding 3D performance, excellent detail in well-lit scenes and great usability, we can’t turn a blind eye to the viewing angle difficulties we had and the loss of detail we picked up in darker scenes. These are major considerations to take into account when buying a TV at this price, and as such we have to deduct a star from the full five. There are many things that the Sony KDL-55W905A TV does well, but the few things it gets wrong let it down and prevent its entry into the top flight.